The biotech industry has pooled together $35 million to “persuade” voters to vote “No” on Prop 37 in California. “Persuade” is the nice way of putting it. Some call them deceptions, some call them outright lies. What I find very sad is that the system allows vested interests to advertize and thus gain votes by spending money — buying votes. So it ends up not about what is best, but who has the most money. Two of the things that the No people are saying is that food will cost more and farmers will be hurt if labeling happens. I would call these downright lies. Click here to read more about the deceptions of powerful industry lobbyists. Seed sovereignty is something to be concerned about. 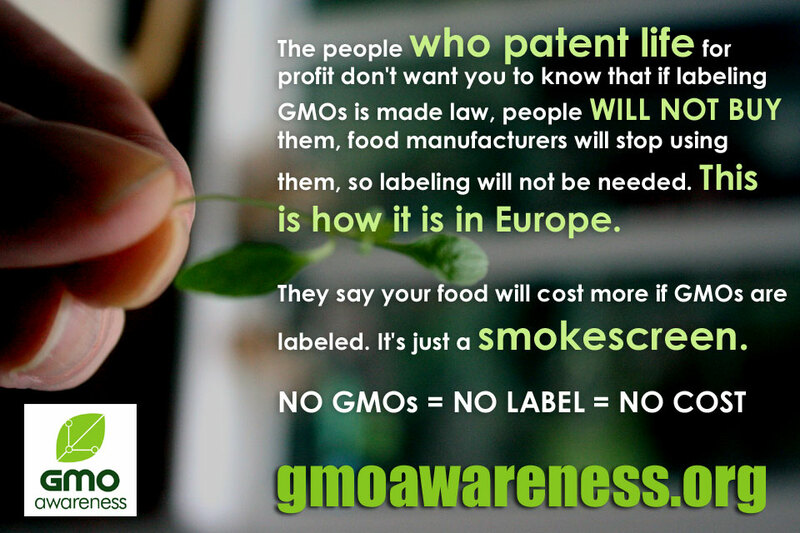 Genetically engineered crops are patented by biotech companies. There’s no saving seed for next year’s planting. And if your farm is next to a GE crop and gets contaminated by pollen from GE crops, you risk being sued by Monsanto for patent infringement. Research scientists who want to do independent testing of these novel and unnatural life-forms cannot, because of the patents — and the biotech companies do not give permission. Beautiful 30 minute film, narrated by Jeremy Irons. Seeds of Freedom charts the story of seed from its roots at the heart of traditional, diversity rich farming systems across the world, to being transformed into a powerful commodity, used to monopolize the global food system.The film highlights the extent to which the industrial agricultural system, and genetically modified (GM) seeds in particular, has impacted on the enormous agro-biodiversity evolved by farmers and communities around the world, since the beginning of agriculture.